And BOOM, another round is in the books. I hit the rack pretty early last night after a full day of treatment and believe it or not actually got a little rest. I drifted off and on because the steroid decadron had me racing but I quieted myself enough to feel rested. Then bounced up this morning feeling good enough to get in a pre dawn 2 mile scamper. That was just what I needed to set the tone for my 2nd day of treatment. Remember, Tuesday is my short day and I only sat in chemo for about 2 hours. And I have to tell you that I spent those two hours the best way I possibly could. Not only did I have the company of my wife and one of my daughters, I also got a visit from my good buddy Katie McByrne who is our regional TNT Director as well as TNT alum and fellow blood cancer survivor Josh White. 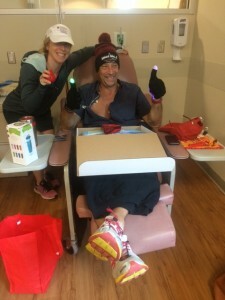 Josh was quite at home at the Crozer Keystone Regional Cancer Center because he is also treated at this same facility. We had a great visit and I really appreciated the love. (And the TNT and LLS goodies). I know Katie was also delivering many positive messages, prayers, and hugs from the extended TNT family, so thank you to all. We got off to a great start today when my nurse from yesterday, Mary Lou, wheeled my favorite “VIP” IV pole across the floor for me to use. I couldn’t find that pole yesterday and I was a little bummed. 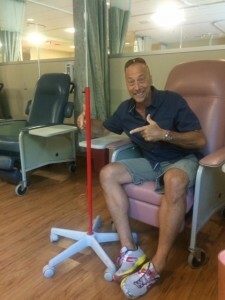 Of course my nurse from last month, Mary Agnes, actually referred to it as the “PIA” pole. But I quickly renamed it to VIP. With my awesome pole, I knew today would be a good day. So what’s next? First I’ll get a white blood cell booster tomorrow because my whites will soon be in the gutter. And from here on out we will check blood counts often and carefully monitor lymph node movement to determine if and when the next treatment should be. One day at a time for now. But my immune system will be compromised for a little while so don’t be offended if you get air hugs and fist bumps. In terms of training and activity, I will do what my body tells me I can do. I have every intention of remaining in motion and in racing the handful of races I have left this year. But I also have every intention of doing it right and putting my health first. This entry was posted in cancer, health & fitness, leukemia & lymphoma society, survivor, team in training and tagged chronic lymphocytic leukemia, cll, crozer keystone, leukemia & lymphoma society, team in training. Bookmark the permalink. Both comments and trackbacks are currently closed.